Lethbridge County’s 2017 BMO Farm Family Award nomination goes to Wayne and Dianna Michaelis of Double Diamond Farms near Readymade School. Every year, according to a recent media release, the Calgary Stampede and BMO Bank of Montreal recognize outstanding farm families in southern Alberta. The awards program was created to promote a renewed urban-rural relationship and to recognize outstanding southern Alberta farm families who best typify the value of the family farmer to our society. “We’re a dry land,” Wayne said, about what kind of farm his family has. “I’ve been farming for about 45 years. Since 1972, basically,” he noted. According to the media release, the program focuses on recognizing the contribution to the enhancement of quality of life as a family unit. 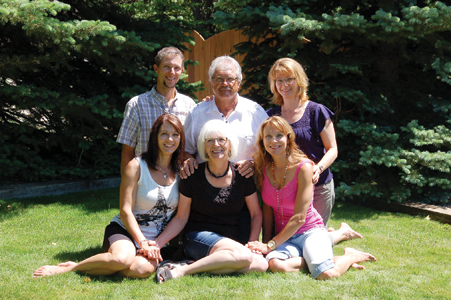 Each year, the municipal districts in southern Alberta nominate one family. The families are brought to the Stampede for the BMO Farm Family Awards, which includes a reception, greetings from Alberta’s Minister of Agriculture, brunch, awards presentation, and family photograph session. The winning families are then treated to an afternoon Stampede Rodeo performance. The 2017 BMO Farm Family Awards will be held on July 10 at the Palomino Room in the BMO Centre.